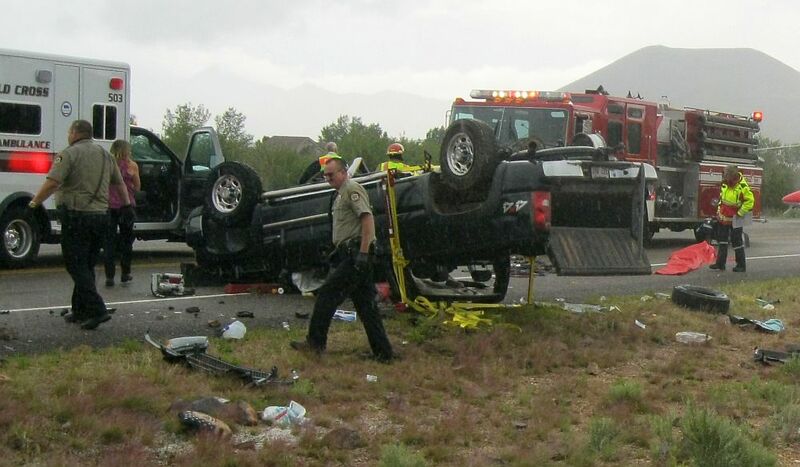 DAMMERON VALLEY — Two pickup trucks collided head-on Monday afternoon on state Route 18 in Dammeron Valley. Both drivers were injured, and one was taken to the hospital by Life Flight. Just before 3:30 p.m., a Chevrolet S-10 pickup with a driver at the wheel who is believed to be a teenager was traveling southbound on SR-18 when, for currently unknown reasons, the vehicle crossed the center line and collided almost directly head-on with a full-size Chevrolet pickup, Utah Highway Patrol Trooper Joe Pastor said. Both vehicles went off the east side of the road, with the S-10 traveling about 100 feet from the point of collision and coming to rest on the shoulder, and the full-size truck leaving the roadway, overturning and landing on its roof. No estimate regarding how fast the vehicles were traveling was available as this report is published. The approximately 50-year-old female driving the full-size truck was trapped in her vehicle until firefighters were able to free her, Pastor said. Life Flight was called to the scene and airlifted the woman to Dixie Regional Medical Center. “Both occupants were believed to have been wearing their seat belts,” Pastor said. The driver of the S-10 was taken via ambulance to the hospital. Pastor said information regarding the condition of the drivers was not immediately available. Traffic was blocked for about 30 minutes while Life Flight was on the roadway. Pastor said a citation would probably be issued to the driver of the S-10 for failure to maintain his lane of travel. 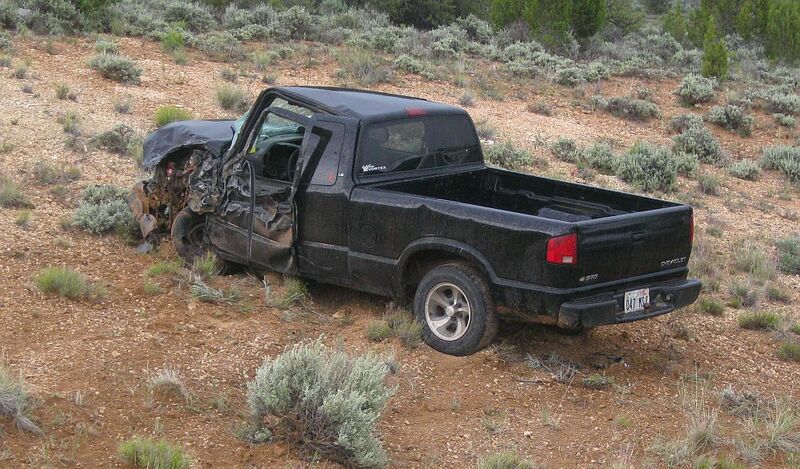 Units from the Dammeron Valley Fire Department, the New Harmony Fire Department, the Washington County Sheriff’s Office and the Utah Highway Patrol responded to the accident. I hope they’re all OK. Speed? It’s rare to find anyone traveling the 65 mph speed limit on Hwy 18. . The norm is 70 to 80+. Put down the phone and drive. These “cross the centerline” accidents were rare before smartphones. Not they seem to happen every day.